This white sedan has an automatic transmission and is powered by a 2.0L H4 16V GDI DOHC Turbo engine. Motivated by that effortless motor it gets 12.6 L/100 km in the city and 9.6 L/100 km out on the highway according to Transport Canada. Our WRX's trim level is CVT. 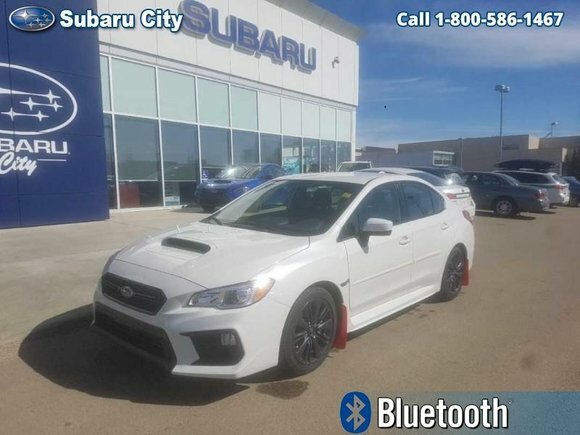 This automatic WRX comes with an approachable price that offers a 6.5 inch touchscreen infotainment system with Sirius XM radio, heated seats, an integrated steering wheel controls, Apple CarPlay and Android Auto along with automatic climate control, power windows, and much more. This vehicle has been upgraded with the following features: Heated Seats, Bluetooth, Rear View Camera, Sirius Xm, Steering Wheel Audio Control, Automatic Climate Control, Power Windows. Want to try the 2019 Subaru WRX CVT?